This Sunday marks the 147th anniversary of the birth of British writer Rudyard Kipling. The author of The Jungle Book was highly prolific, penning numerous short stories and poems, and three novels. Along the way, he coined and popularized quite a few words. Here are 10 of our favorites. Related to grincer is grincheux, a cranky person. Some speculate that Theodor Geisel, aka Dr. Seuss, may have been influenced by grincheux when coming up with the name of that ultimate holiday killjoy. Old school, meaning “of the old school; of earlier times; as originally or formerly established, propounded, or professed; old or old-fashioned,” is much older, originating around 1749, according to the Online Etymology Dictionary. Penny-farthing, “an early bicycle having a large front wheel and much smaller rear one” (perhaps named for the different sizes of the coins), came about later in 1927. Cletus Spuckler, aka “Cletus the Slack-Jawed Yokel,” is a stereotypical redneck character on the animated TV series, The Simpsons. A Svengali is “a person who, with evil intent, tries to persuade another to do what is desired,” and is named for Svengali, “the hypnotist villain” in the 1894 novel Trilby by George du Maurier. Kipling’s is the first recorded figurative use of Svengali. In the quote, the speaker is referring to “a dog with a mesmeric stare,” says the OED. 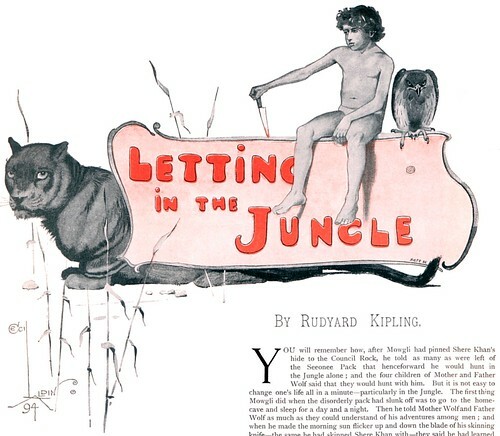 This entry was posted in authors, Word Soup and tagged kim, rudyard kipling, the jungle book. Bookmark the permalink. I disagree, Andrew N. The phrases were not meant to lead into each other, to conclude one point- rather to describe those individuals as BOTH slack-jawed and loose-lipped. Thanks for the info, a lot of things that I was not aware of!! !